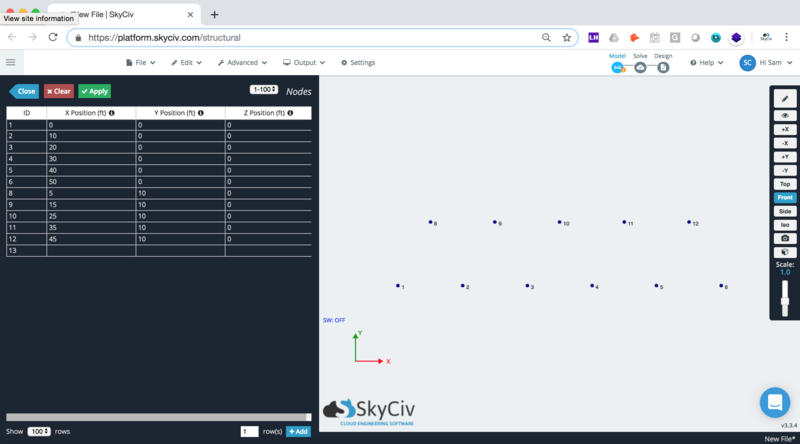 By default, SkyCiv Truss will give all members a pinned connection. This is denoted by a little black dot which if you hover over it, will show “FFFFRR”. In Structural 3D, you will have to manually change all Start Fixity and End Fixity to “FFFFRR”. It is essential that all your members are pinned, or your truss analysis results could be wrong. 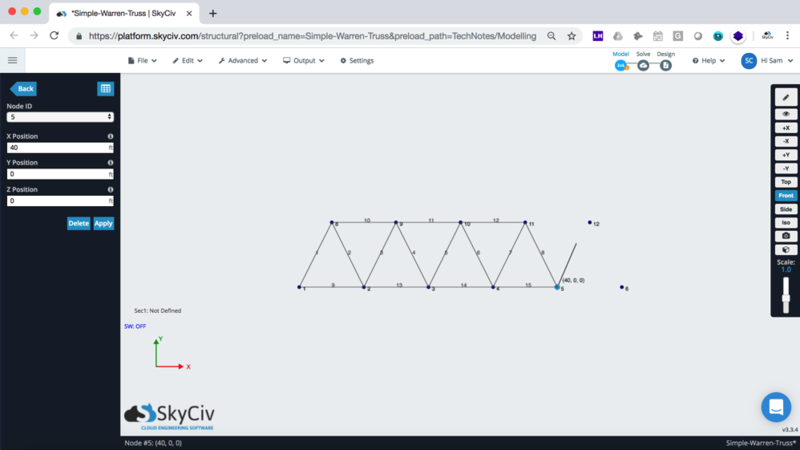 Remember, at anytime you can log in and review our sample model Simple-Warren-Truss.s3d to see this example. A truss should have all member fixities set to pinned. What this means is that each member is free to rotate and the transfer of forces are all in axial. A quick way to check if your model is setup correctly, is when you solve it – all bending moment member forces should be 0. In structural engineering, we need our models to be static. At the moment, our truss is not connected to anything, so if we apply loads to it there is nothing holding it still. Supports are our boundary conditions – they are what stop the truss from moving when loads are applied. Think of a truss bridge, at either end it is connected to land. Supports also have fixity codes to them – these indicate how the truss is supported. For instance, a roller support means the truss can move left to right (i.e. it can translate in the x direction). Our Truss is now sufficiently supported, we can now proceed with applying loads. Once you’re happy with your Truss, click Solve in the top right corner. In S3D it might prompt you to add a section, just click Repair for some nominal section properties. Note: if you need to add section properties, you can do this via Section, but in looking at reactions at supports and axial force, the section properties shouldn’t really affect your results. If everything is setup correctly, you should be able to click Axial to review your axial force results. Axial force is the force applied as either tension (member being pulled apart) or in compression (member being pushed in). Generally dealing with trusses – axial force is the most important result. Want to teach this in your class? 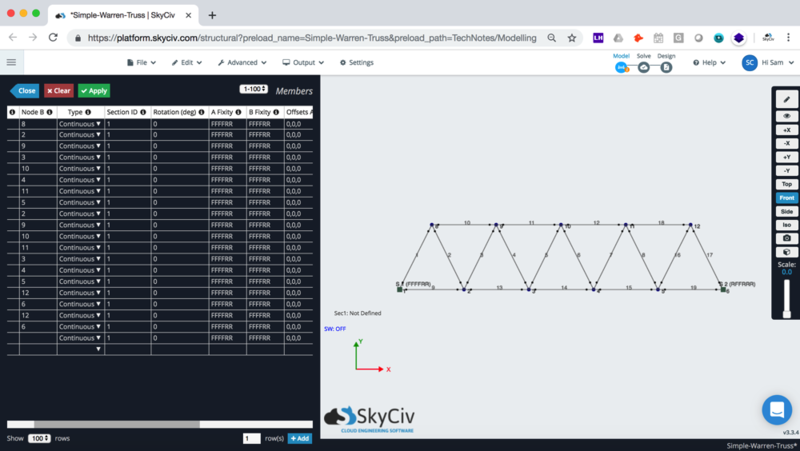 SkyCiv has Educational Accounts allow students and instructors access to SkyCiv software for teaching purposes. Interactive lesson plans such as this to help educate the future engineers of the world.